A tumultuous Mayors’ Council meeting today ended with TransLink management being provided with the approval they need to start planning for the Fraser Highway SkyTrain extension. The region’s mayors voted to approve TransLink’s work plan for the 16-km-long project, which has an estimated 15-month timeline to reach the milestone of completing a business plan. The South of Fraser rapid transit strategy will also be refreshed to reflect the cancellation of the Surrey Newton-Guildford light rail transit project (LRT) and adoption of SkyTrain on the Fraser Highway. If all goes as planned, a significant portion of the Expo Line’s extension could be completed by 2025. The remaining journey to Langley Centre is dependent on securing funding for the third phase of the Mayors’ Council’s plan. “It is totally doable. It is achievable. It is realistic,” said Sany Zein, Vice-President of Infrastructure Management and Engineering for TransLink. 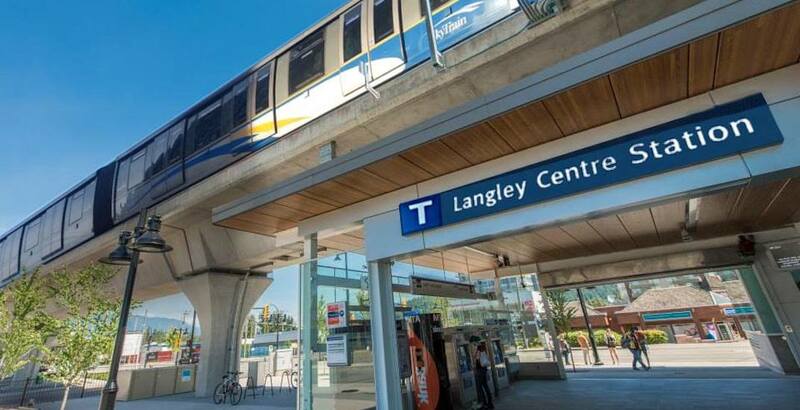 The previously publicized $2.9-billion cost estimate, including a 25% contingency of about $700 million, for the entire extension to Langley assumed building the entire project in one go. Given the possibility of a SkyTrain extension being expedited, the Mayors’ Council also approved TransLink’s recommendation to cancel the new Fraser Highway B-Line that was planned as part of the first phase transit expansion plan and redirect those funds towards improving the existing 96 B-Line on the Newton-Guildford corridors. It was reasoned that the new B-Line infrastructure on the Fraser Highway would only last for a few years before being demolished for SkyTrain construction. A request from Richmond Mayor Malcolm Brodie to have the City of Surrey pay for some of the estimated $57 million spent by TransLink on LRT planning was also approved, with support from even Surrey Mayor Doug McCallum. However, the amendment on the municipal government covering “unnecessarily expended” costs was only approved after changes were made to not include a specific dollar figure and to allow Surrey to provide in-kind compensation — such as land value and other benefits — instead of solely cash. Brodie, one of the most vocal critics on the board of the switch to SkyTrain, also posed questions over whether Surrey residents truly wanted SkyTrain over LRT. McCallum argued this is the case. “I can assure everybody that overwhelming numbers of Surrey residents support SkyTrain over LRT. The results of the election is a referendum on what type of system the residents of Surrey want,” said McCallum, who went on to emphasize the need to examine the project on a holistic regional picture. The Mayor of Surrey said in his discussions with the federal and provincial governments, they examine funding requests on a regional level and have a preference for creating a regional backbone transit network. “They have all indicated to me that they look at us as a metro region, not individual cities. And this board needs to look at it as a metro region, instead of hearing it as ‘my city this’ or ‘my city did that’. We need to look at the metro system,” said McCallum, noting that he has Vancouver Mayor Kennedy Stewart’s full support on this perspective. Backing up McCallum, Langley City Mayor Val van den Broek expressed her municipal government’s preference for SkyTrain, as well as the apparent support for the technology in her community. “Langley City would like the SkyTrain option as well. We have been deemed a regional hub for a long time. The Fraser Valley feeds into us, the highway is bottlenecking, people are cutting into our city with their cars, and we’d like to see that reduced,” she said.